Elchanan Mossel works in probability, combinatorics and inference. His interests include combinatorial statistics, discrete Fourier analysis, randomized algorithms, computational complexity, Markov random fields, social choice, game theory, evolution and the mathematical foundations of deep learning. 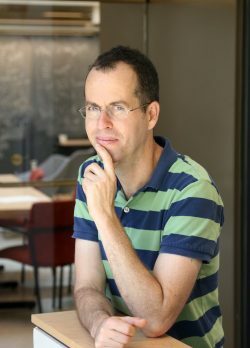 His research in discrete function inequalities, isoperimetry and hypercontractiviting lead to the proof that Majority is Stablest and confirmed that optimality of the Goemans-Williamson MAX-CUT algorithm under the unique games conjecture from computational complexity. His work on the reconstruction problem on trees provides optimal algorithms and bounds for phylogenetic reconstruction in molecular biology and has lead to sharp results in the analysis of Gibbs samplers from statistical physics and inference problems on graphs. His research has resolved open problems in computational biology, machine learning, social choice theory and economics. Elchanan Mossel received the B.Sc. from The Open University in Israel in 1992. He received both the M.Sc. (1997) and Ph.D. (2000) degrees in mathematics from the Hebrew University of Jerusalem. He was a post-doctoral fellow at the Microsoft Research Theory Group and a Miller Fellow at U.C. Berkeley. He joined the U.C. Berkeley faculty in 2003 where he was a professor of statistics and computer science. He spent leaves as a Professor at the Weizmann institute (2008-2010) and at the Wharton School, University of Pennsylvania (2014-2016). Professor Mossel is on the senior faculty of the Mathematics Department, with a jointly core faculty appointment at the Statistics and Data Science Center of MIT’s Institute for Data, Systems and Society (IDSS).